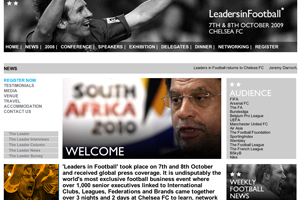 Leaders in Football is taking its annual conference outside the UK for the first time to La Manga Club in Spain. Leaders in La Manga is anticipated to attract 50 senior executives from the sports industry and will take place on 21-23 March 2010. Manchester United, Liverpool, Arsenal, Chelsea, Tottenham, Barcelona, Real Madrid, Juventus, Inter Milan, Bayern Munich, Celtic and Rangers football club representatives plan to attend the conference. They will be joined by representatives from FIFA, the FA, UEFA, NFL, NBA, RFU, F1 and PGA among other sporting bodies. La Manga Club football manager Fran de Paula said: "We are delighted that Leaders in Football as chosen La Manga Club resort for its first event outside the UK and we look forward to providing the delegates with the perfect environment in which to network, meet and relax." La Manga Club offers eight sports pitches for football, cricket and rugby, three 18-hole championship golf courses, a 28-court tennis centre and a 2,000sqm spa.